I love the Big Bend. It's probably the least-visited, most unappreciaated of the national parks, and that makes it just about perfect. Hot, dry and prickly, you won't like it if you hate the desert. Most every living creature bites or stings, and the plants protect themselves with spikes and thorns. You must approach the desert with respect and caution, but if you can enjoy the raw, rugged beauty, it can be a wonderous place. 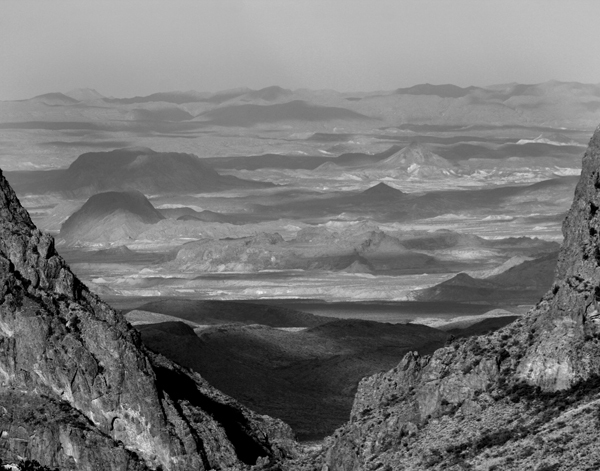 This shot through "the window" of the Chisos Mountain basin looks out on a vast expanse of the Chihuahuan Desert. The shadows that raced north across the desert that November day in 2009 emphasized the many ranges of mountains stretching far into Mexico. © Dave Berry 2012. All rights reserved.